George H. Stroud became vice president for student life and dean of students on July 16, 2018. 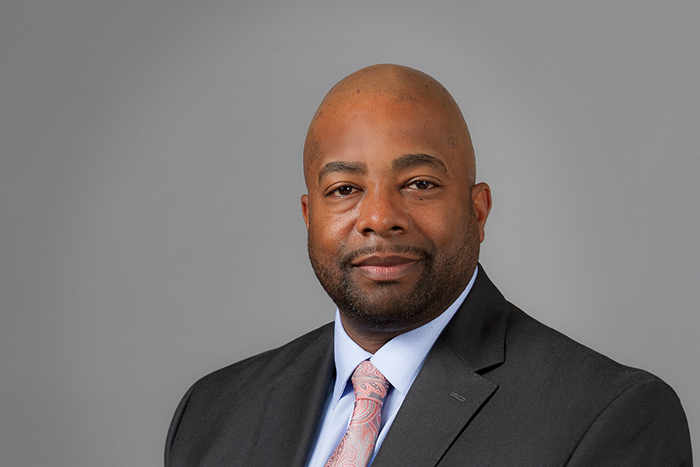 George Stroud, assistant vice president for student life and dean of students at Cabrini University, will join Dickinson as vice president for student life and dean of students on July 16. Stroud replaces Joyce Bylander who is retiring after 20 years at Dickinson. Stroud will serve as a member of the president’s senior staff and provide strategic leadership for collegiate athletics, the Wellness Center, residence life, campus engagement, Landis House, career development and public safety. “I am very pleased to welcome George to Dickinson. His energy, experience and vision make him the right person to lead student life at this important time,” said Dickinson President Margee Ensign. Stroud brings 25 years of experience as a student life leader at a variety of institutions, including the University of Pittsburgh, Slippery Rock University and Carnegie Mellon University. At Cabrini, Stroud was a member of the president’s cabinet and served on the student engagement committee of the Board of Trustees. He was responsible for leading residence life, student diversity initiatives, dining services, public safety, health services and counseling services. He led a campuswide effort to create the Cabrini University Inclusivity Plan; developed a student life assessment plan; and oversaw Title IX compliance. He also collaborated with academic affairs and parents to create a parent support group at Cabrini; served as a member of the critical incident response team and enrollment management team; and served as an advisor to the black student union. Prior to Cabrini, Stroud was assistant director for staff supervision, recruitment and training for residence life at the University of Pittsburgh; assistant director in the office of minority student affairs/cultural diversity at Slippery Rock University; and counselor for Carnegie Mellon’s Action Project, where he developed a first-year seminar and served as a personal academic advisor and career counselor to undergraduate, ethnic minority students. He is a member of many professional organizations, including the National Association of Student Personnel Administrators, and is an active leader in the Delaware County community serving on the boards of Laurel House, a shelter for victims of domestic violence; Agape Community Outreach Ministries; and the Mt. Airy (Pennsylvania) Baseball Association. He also is a volunteer baseball and track coach. Stroud holds an Ed.D. in higher education administration from Widener University and a master’s in student personnel from Slippery Rock University. He and his wife, Stacey, have three children.